Crestware HG3 Heat Guard Oven Mitt 13"
TigerChef > Smallwares > Food and Employee Safety Products > Oven Mitts and Pot Holders >< Oven Mitts > Crestware HG3 Heat Guard Oven Mitt 13"
✔ Professional grade✔ Dimensions: 28" x 17" x 19"
$4.39 Crestware SG3 Silicone Freezer / Oven Mitt 13"
$12.49 Crestware HG24 Heat Guard Oven Mitt 24"
$6.29 Crestware HG5 Heat Guard Oven Mitt 15"
$7.09 Crestware HG7 Heat Guard Oven Mitt 17"
Use the Crestware HG3 Heat Guard Oven Mitt 13" to handle freshly baked pies, cooked casseroles, and more. A must-have in any industrial or commercial kitchen, these oven mitts withstand extreme heat to keep your kitchen staff safe from accidental burns and injuries. Each mitt is ambidextrous so users can quickly slip them on either hand for quick and easy use. 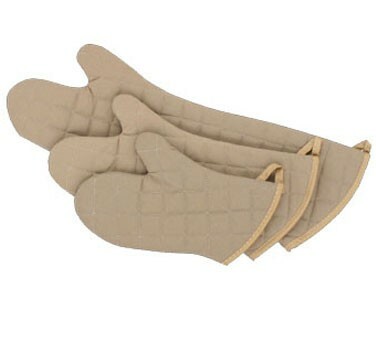 For added convenience, these oven mitts are designed with a hanging loop for convenient storage. Dimensions: 28" x 17" x 19"